My publisher, Inspired Quill, has created an online course in online marketing. It ordinarily costs $147 but there are a limited number of slots for $47 if you use the code IQSCHOLAR. As one of IQ's authors, I took it for free. I thought it was pretty good. Feel free to tell anyone you think might be interested. I have a short story in this month's issue of Swords and Sorcery Magazine. I'm posting the link here because I thought maybe some of you might recognize it as based on my fanfic "The Spy," which was about Beliond rescuing a town. I de-Tolkienized it and then realized I had to give it some meaning that it lost in that process. It's free to read it if you're interested. It is with great sadness that I tell you Nilmandra died today after a long battle against a degenerative disease. She was 52. I met Nilmandra in early 2003 when I posted my first fanfic on Fanfiction.net and she was the first reviewer. By the time I finished that story, she was my beta reader and was beginning to teach me most of what I know about writing. She was in the middle of posting "May the Valar Protect Them" and of course went on to write many more stories. She founded Stories of Arda in July of 2003 after a month in which Fanfiction.net was down more than it was up. At that time, the two major places to post Tolkien fanfic were ff.net (which was and still is open posting) and HASA (where each story had to be voted into the archive and had to be complete to be considered). Nilmandra wanted a story archive that would be technically reliable and devoted to well-written stories that fit within what she saw as a canonical Tolkien world. Her sister Rorrah designed the site, and SoA was born. I know the fate of SoA will be of interest to many people reading this, and they should rest easy. Nilmandra and Rorrah arranged between them to have SoA go on unchanged. Though she had little use for organized religion, Nilmandra was a devout Christian and drew deep comfort from her faith, especially as her health failed. Additionally, she told me that among the things she valued most were the friendships she'd made through Tolkien fanfiction. She wrote me: "It was Middle-earth that brought us together, and I pray that after all the critical things are done, we will have a chance to sit with the professor and get answers to some of our questions about twice born Balrog slayers, whether Gimli sailed with Legolas, if both twins were reunited with a happy Celebrian and Elrond in Valinor etc ,but there will be so much more that we will want to know about his creation and how he intended to end it." I will miss Nilmandra deeply. She was my teacher and the person who created the site I think of as my fanfic home. More than that, she was my friend. I am sad beyond my ability to say. I will cross post this to the SoA Yahoo list, Nilmandra's LJ, and my own LJ. Please feel free to share it with anyone you think might want to know about our loss. "And the ship went out into the High Sea and passed into the West, until at last on a night of rain, Frodo smelled a sweet fragrance on the air and heard the sound of singing that came over the water. And then it seemed to him that as in his dream in the house of Bombadil, the grey rain-curtain turned all to silver glass and was rolled back, and he beheld white shores and beyond them a far green country under a swift sunrise." --"The Grey Havens," Return of the King, J. R. R. Tolkien. I'm getting ready to send my November newsletter. This month, it includes excellent links to sites about revision for all you NaNo writers. Go to http://dawinsor.com and sign up in the side bar. Or message me your email address and I'll sign you up manually. I'm getting ready to send my first newsletter early next week. I decided to summarize blog posts in it, so people could just wait to see if there was a topic they were interested in and click through. I'll also include any events I went to (this month, I-Con) and maybe interesting links if I find them. I miss how lively LJ used to be. I miss a lot of things about the old LOTR fanfic days, actually, but the friends I made on LJ are what I miss most. However, my new publisher says I need a blog and it needs to be on Word Press. So, today I made my first post there. It's about how studying engineers and writing ya fantasy are totally alike. I can't figure out how to make the post appear directly here. So in the meantime, I'd love it if you went over and read and commented. If you sign up for my newletter there, I'll send you that once a month with a summary of what's on the blog so you can click if you want and don't have to make separate trips. Jena Baxter's Bookworms posted the first chapter of DEEP AS A TOMB yesterday. If you're so inclined, you can check it out and see what I've been writing. Goodreads has a Christmas giveaway running for DEEP AS A TOMB. I believe it expires New Year's Day. Enter for a chance at a free copy. I have a guest post up at Unleashing Readers today. When you write a story set in a made-up or secondary world, one of the small but significant problems you run into is giving characters a good way to call on their god(s). They could be cursing, invoking a deity as witness, or maybe asking for a god’s help. This is challenging because in a secondary-world story, the author makes up things like the god(s), the cultural notions of the afterlife, and what kind of supernatural creatures might be around to tempt or help a character. A character can’t say “hell” if the culture doesn’t believe in such a place, or “she looked like an evil cherub” if the world doesn’t have cherubs. 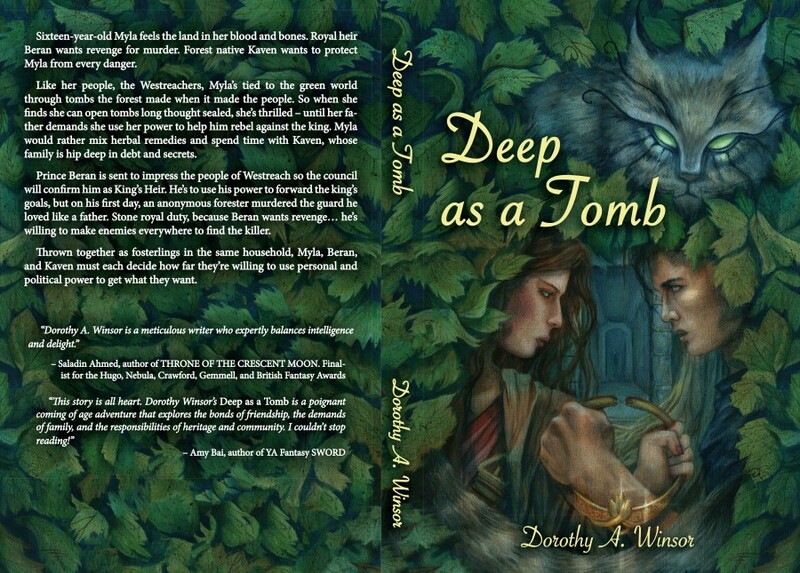 Deep as a Tomb's kindle version is on sale for 99 cents right now at Amazon. Total surprise to me. I have no idea whether Amazon or my publisher originated that one. I'm reading the second book in Rachel Caine's Ink and Bone series. Really good YA fantasy based on the premise the librarians hold all the power in this world. Like power holders everywhere, that can be a problem. I just finished Liane Moriarty's Truly, Madly Guilty. It drove me crazy for a while by withholding information that some of the POV character had, so it felt like I was being teased. But I still enjoyed it. I stopped reading and threw away two different YA books in the last few weeks. They annoyed me. 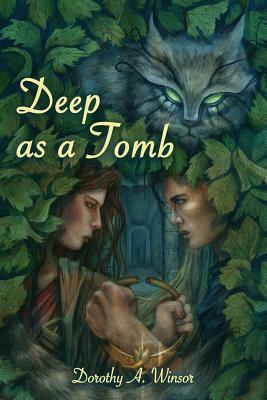 There's a Goodreads giveaway of DEEP AS A TOMB running until November 4. No obligation, but if you're interested, just click. DEEP AS A TOMB is still available only in paperback, but Amazon has it discounted to $12.94 for some reason. And you have the chance to leave the first review! First! First = winner! Also, I posted a new chapter of "The Enemy Within" on SoA and ff.net. DEEP AS A TOMB is now up on Amazon, though the cover pic still isn't showing. It's YA fantasy with murder, betrayal, and some smooching. Not every book is right for every reader, but if this sounds right for you or someone you know, buy, read, review, fanfic, whatever! With a small press, the writer's biggest problem is helping the right readers find the book. I sent some bookmarks for DEEP AS A TOMB to the printer today. The cheapest rate gave me a thousand of them so if you want some, PM me a US address and I'll send you as many as you want. Give them out in class! Put them in swag bags! Foist them on trick or treaters! I've read a couple of good MG books lately. Lauren Wolk's WOLF HOLLOW is a powerful book about guilt, responsibility, the rippling effects of malice, and the loss of innocence. The narrator is a woman looking back on events that happened when she was 12, living happily on a farm during WWII. Apparently Wolk wrote it as an adult book and the publisher talked her into releasing the book as middle-grade fiction. Frankly, I found the book so tense that I'd have been traumatized by reading it at, say, age 10. It's extremely well done though. I recommend it. I also read THE BLACKSTONE KEY by Kevin Sands. It's a middle grade book set during the Restoration, and it's a good read for adults as well as kids. It's interesting to see how some MG and YA books cross over to adults well and some don't. I don't know what the difference is. In this book, an apprentice apothecary and his friend break codes to solve a mystery. I also read a good YA book, E. M. Kokie's RADICAL, which is about prepper culture. It's in first person, and that can make it hard for a writer to convey details about the MC, who's unlikely to be narrating about themselves. In Chapter 1 of RADICAL, Kokie does a clever thing with that problem. I like clever. It's a timely book, given the growth of the Sovereign Citizen movement and the paranoia that leads a small number of people to amass a large number of guns. Now I'm reading the new Louise Penny mystery. This series is set in a small town in Quebec and has a wonderful sense of place. I've been doing what feels like a last round of revision for a new book. I've worked on this on and off for a while so you may have heard me talk about it before. The MC is a 15-year-old boy who's marooned on the streets of a quasi-medieval city. To earn a few pennies, he pretends to be able to tell fortunes. Then he accidentally tells a true fortune for the prince and is taken into the palace to be the royal fortune teller. Good news: food and a warm bed. Bad news: He can't tell fortunes. Anyway, when I revise, I run into two issues over and over. (1) My enjoyment of humor often leads me to undercut the story's tension with a joke. (2) I have a hard time being mean enough to my characters. Actually, undercutting tension with humor may be part of #2 too. I'm uncomfortable when things get bad. Also I tend to lay out my plot first, and while concentrating on it, I skim over the real emotions a real person would feel in the situation. So I have to go back and think about those and make them clear and real. Here's the cover for the YA fantasy I have coming out in November from Loose Leaves Publishing. Gorgeous, no? As a follow up to what I posted yesterday, when Zharmae closes at the end of August, my rights revert to me and I will put the e-book for FINDERS KEEPERS back up on Amazon. I've put a e-book short story up there, so I know how to do that. I'm uncertain if I'll create a paperback because I don't know how hard that will be. My point is if you want to be sure to get a paperback, you need to buy it before the end of the month. In the meantime, I'm writing promotional material for DEEP AS A TOMB, revising a book tentatively titled THE WIND READER, and reminding myself of how to self-publish FINDERS KEEPERS. I am leaning new stuff. Yay! Fun moments in small press publishing: the publisher of my first novel is closing its doors at the end of the month. All rights revert to me, so I think I’ll self-publish that one. In the meantime, my shiny new publisher is forging ahead with the book due out in November, which takes the sting out a little.